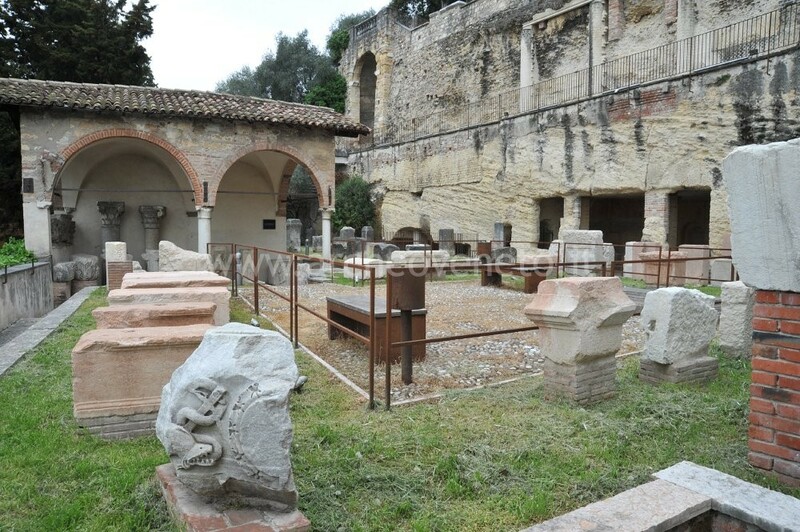 The Archaeological Museum at the Roman Theatre was opened in 1924 in the former monastery of Gesuati, which was built in the late 14th century behind the theatre. 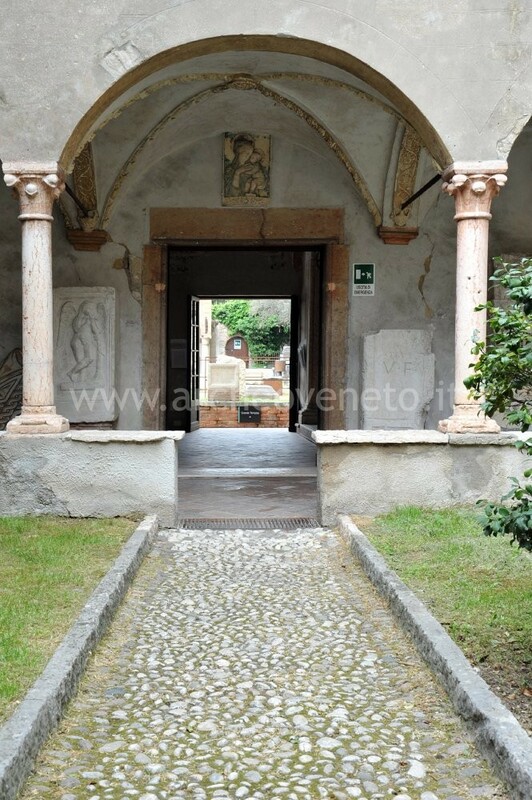 The exposition is set out on different terraces, as well as in the monastery itself; it contains material from the theatre, from Verona and its hinterland, and from collections acquired over time. 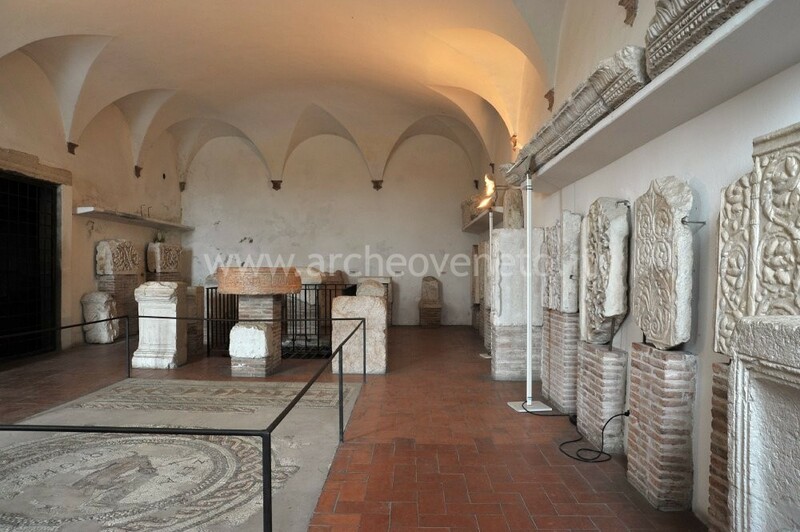 The Archaeological Museum at the Roman Theatre, in one of the most attractive and archaeologically important locations in Verona, is an excellent example of a city museum. The first archaeological excavations of the Roman theatre were carried out in the first half of the Nineteen century by Andrea Monga; the work was finished by the Verona Council, which acquired the land in 1904 and rebuilt part of the ancient structures. 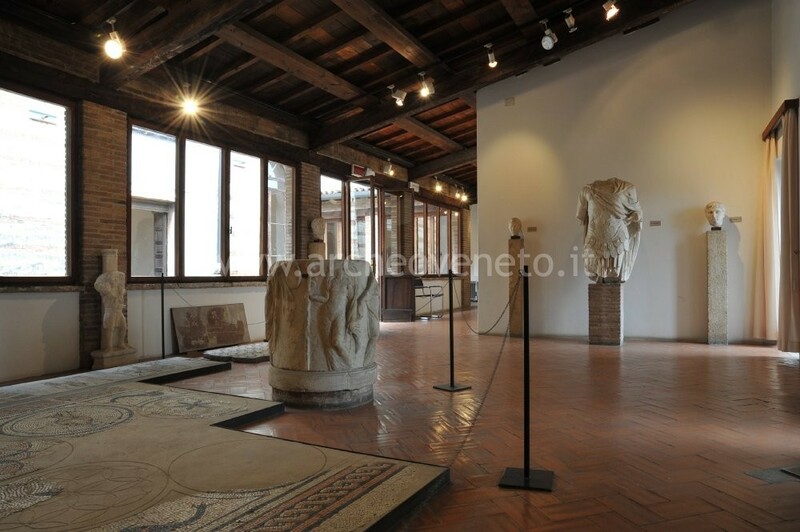 The archaeological collections of the Verona Council remained at the civic Museum of Porta Vittoria (now Natural History Museum) till to the birth of the Archaeological Museum at the Roman Theatre. The current exhibition combines parts equipped during last century and zones recently reset and opened to the public. From here you continue the visit both to the Roman theatre and to the Museum. The visit can start either in the sacred inscriptions room (access from the west theatre staircase) or in the room near the lift (access from the lift at the top of the theatre). Access to this room is from the west staircase that leads from the theatre to the monastery basement. In the middle there is the II-III century AD polychrome mosaic that was found in a rich Roman villa in Piazza Bra. The mosaic shows Bacchus with panthers. 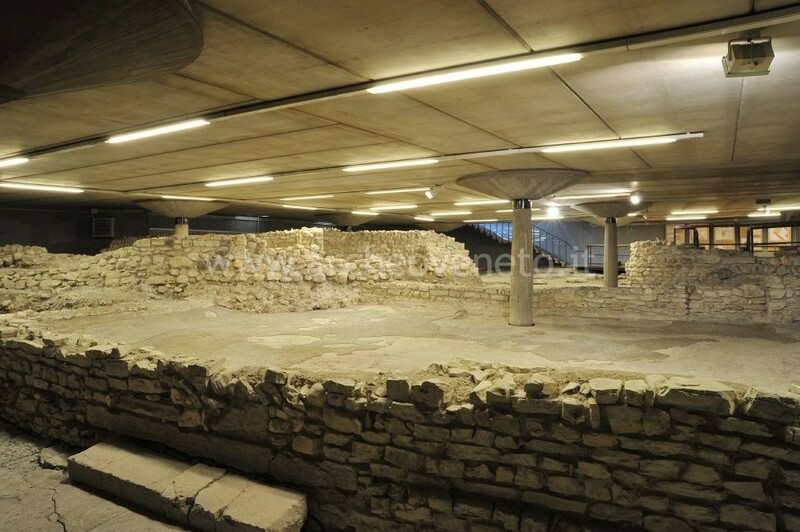 Next to the mosaic there is a space which separates the theatre seating from the hill. 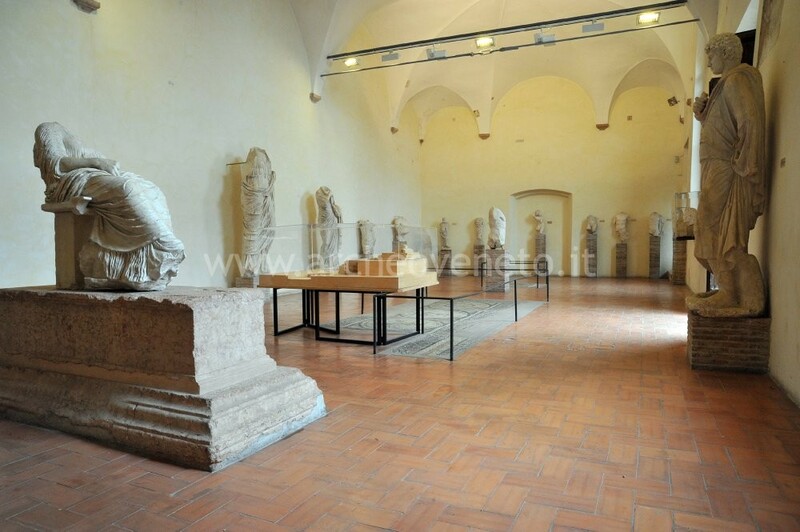 This room houses the many sacred inscriptions (altars and statue bases) dating to the Roman Imperial period. These attest to the presence of cultic areas in Verona and its hinterland. On the left wall there are two inscriptions dedicated to Saturn and a small altar dedicated to Hercules. Above these there are some decorative architectural pieces. 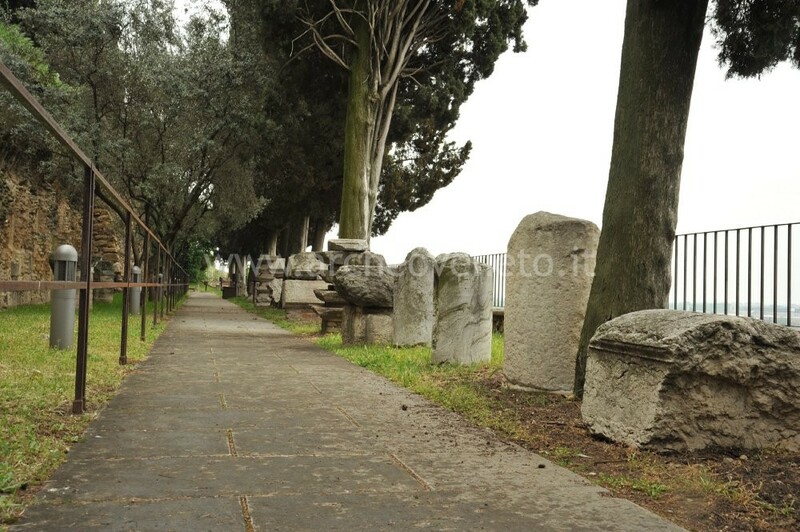 Opposite the entrance you can find five sacred inscriptions to Jupiter Optimus Maximus (the principal Roman deity), to Jupiter Summanus (god of night time lighting), and to Jupiter Lustralis (god of water cults). There are also fragments of votive altars dedicated to Fortune (fragment of a circular statue base, II century AD), Diana, Jupiter Optimus Maximus and Dite (Italic goddess of the underworld), and to Prenets. On the right there is a funerary base showing Silenus with a basket of fruit (I century AD), a bass relief of parts of the acanthus plant (found in Lungadige Sanmicheli), and an altar with a priest sacrificing on one side, and, on the other, a priestess with veiled head, probably from the temple of Minerva at Marano in Valpolicella. Between the door and the stairs there are various altars dedicated to Isis and Serapes (Egyptian deities), Vesta (from Negarine), Mercury and Minerva. The room by the stairs shows a late antique polychrome mosaic, decorated with baskets and vases, as well as five inscriptions dedicated to Matrones (Celtic female deities), and to Parentes gods (spirits of the ancestors). In the cloister there are many funerary inscriptions dating to the Imperial period (late I century BC – III century AD). Against the left wall several funerary steles and stones are displayed. Among them, there are a funerary stone showing a seated cupid with his arm resting on an overturned lamp (which symbolises the end of life), and a funerary stele with a Gorgoneion on the tympanum. Against the wall opposite the entrance there is a funerary stele dedicated by Cassius Optatus to his parents, who are represented in a semicircular niche. Against the right wall there are other important funerary steles, such as the richly decorated one dedicated by Marcus Selius Speratus, and that of Marcus Cassius Denticulus (quattuorvir, architect and military tribune) made of Veronese red stone. Against the same wall there is also a funerary stele showing the dead as standing soldier, and a cylindrical funerary stone from Zinella (in ancient times the hinterland of the town of Este) depicting a rabbit caught in the claws of a feline. In the church, temporary exhibitions take place. 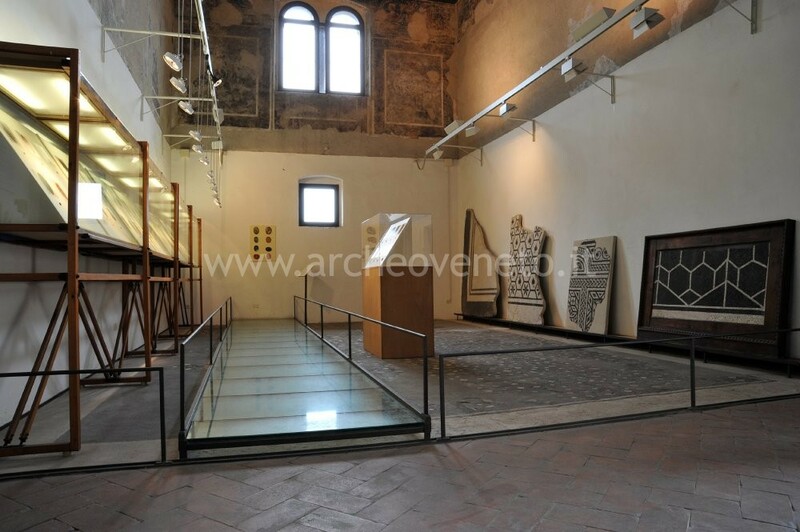 On floors and walls, mosaics recovered from Verona’s city centre are displayed. 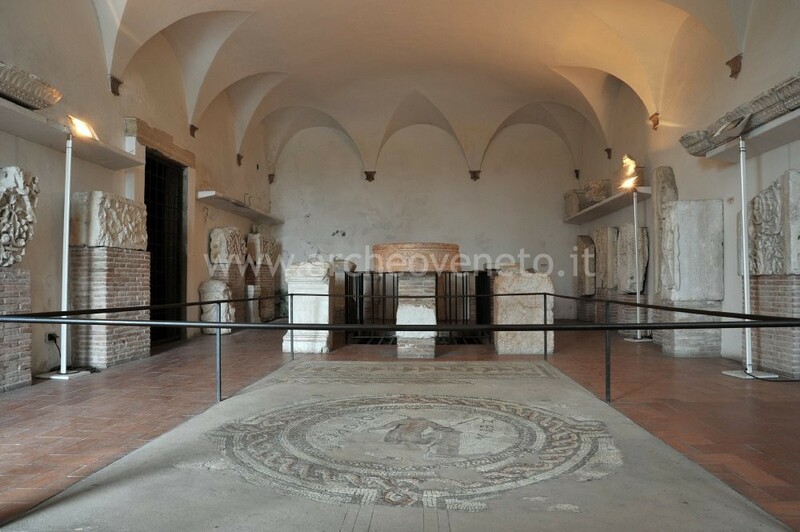 The most prominent mosaic is the one from via Portichetti Fontanelle, made up of coloured marble pieces on a black background with a white frame (late I century BC – beginning of I century AD). 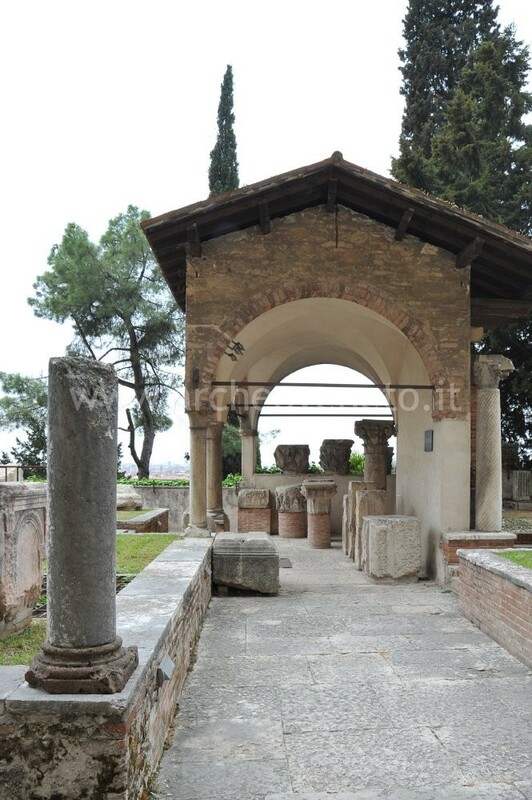 By the large terrace there are marble and stone materials from Verona and its hinterland dating to the Roman period. Against the uphill wall of the terrace, which was cut in the rock, a nymphaeum was built in Roman times. 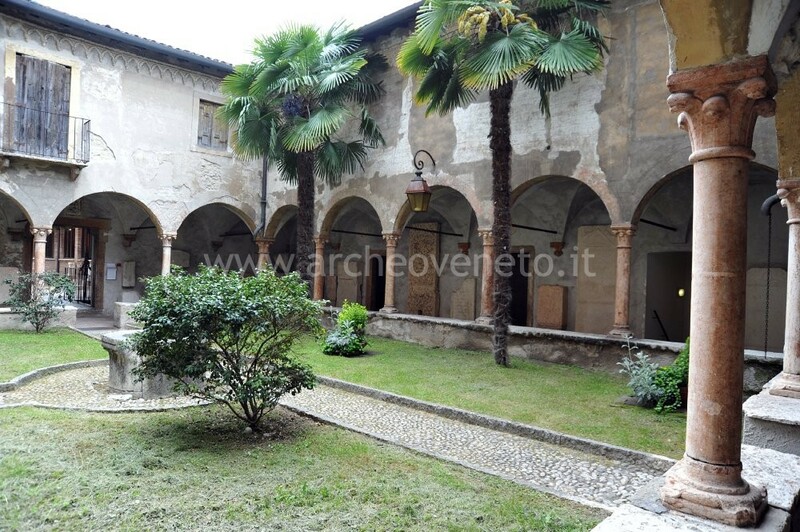 Later, the Gesuati built a large cloister on the terrace; part of its porch is still visible. 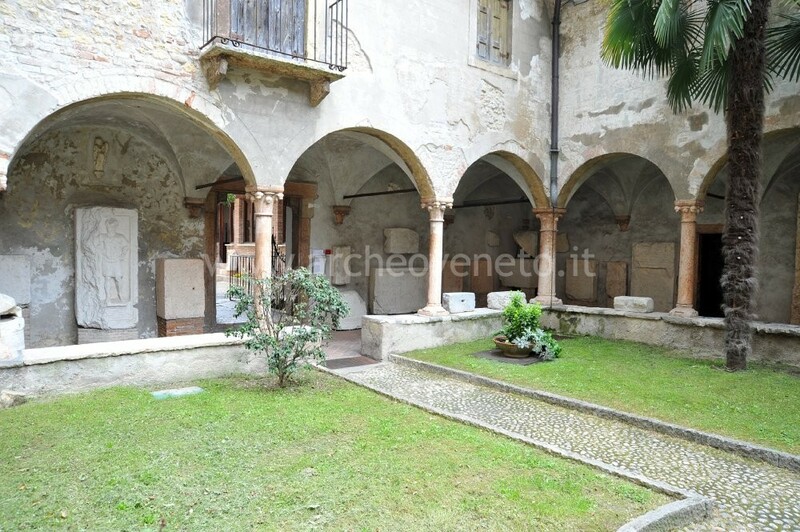 Against the external wall of the church of Saint Gerolamo, there are funerary inscriptions and architectonic elements, including a capital, several small arches, and a fragment of an architrave. Examples of different types of capitals (two of which are not Roman) are displayed under the two arches that come from the ancient cloister. Next to these architectonic elements are some figurative stones (three winged cupids and one shepherd with his dog). 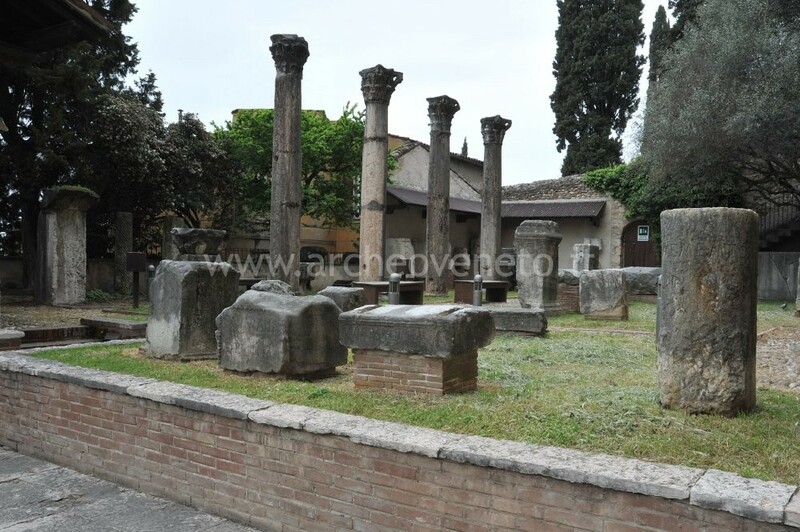 Beyond the remains of the cloister there are four columns (whose capitals are not original), architectonic elements from public buildings, and a group of funerary monuments. 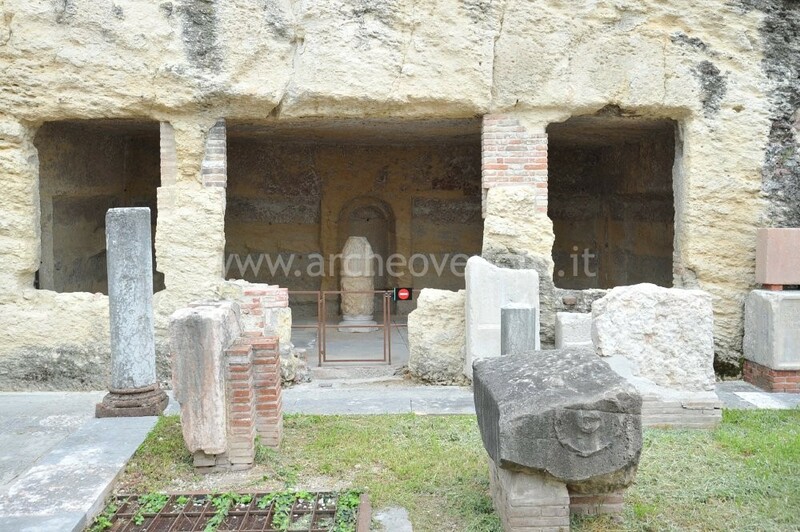 Beyond the northeastern wall, through openings in the wall, you can see the nymphaeum in whose floor were placed mosaics taken from the Late Roman villa of Montorio. Some inscriptions in local red limestone are positioned in front of the wall; these were found in nineteenth-century excavations along the Adige river. Against the wall opposite the entrance there is a headless honorary statue dating to the early Roman imperial period found in Vicolo San Clemente and a fine portrait of Octavian found in Piazza Duomo. Archaeological and building materials are displayed on the shelves. Two cases display materials from buildings: these include antefixes of Magna Grecian and Roman production, two brick fragments, and a bronze door hinge. 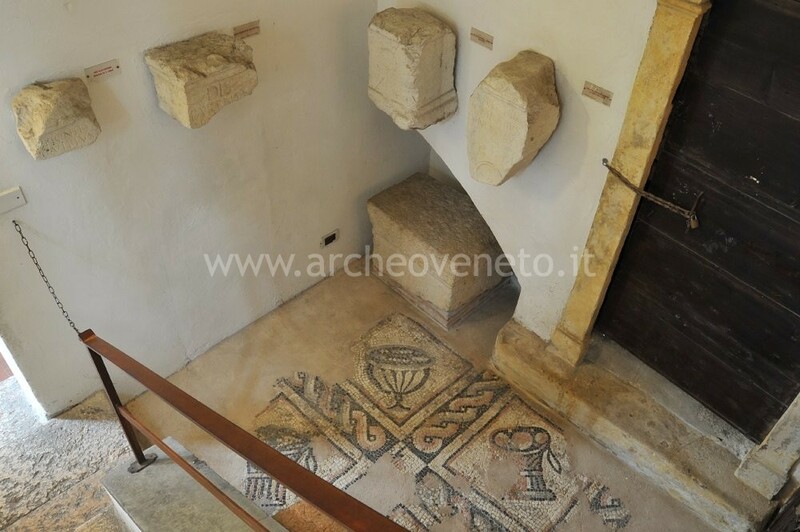 Two mosaics from the Roman villa of Negrar (III century AD) hang on one wall. One depicts a scene with supplicants, and the other shows a cherub driving a chariot. 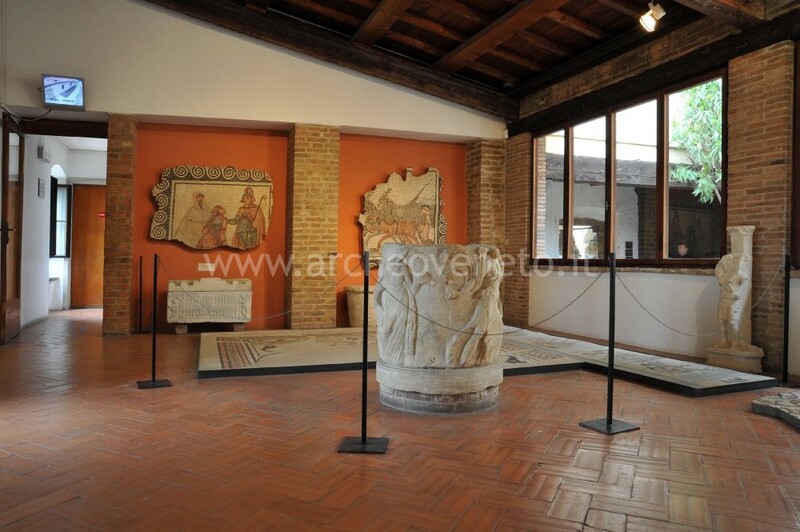 Below the mosaics, there is a marble sarcophagus with two eroti, several stone funerary urns, a geometric mosaic with dolphins, vases decorated with scenes of gladiatorial fights, and a marble puteal with dancing Maenads in a Neoattic style dating to the I century AD. 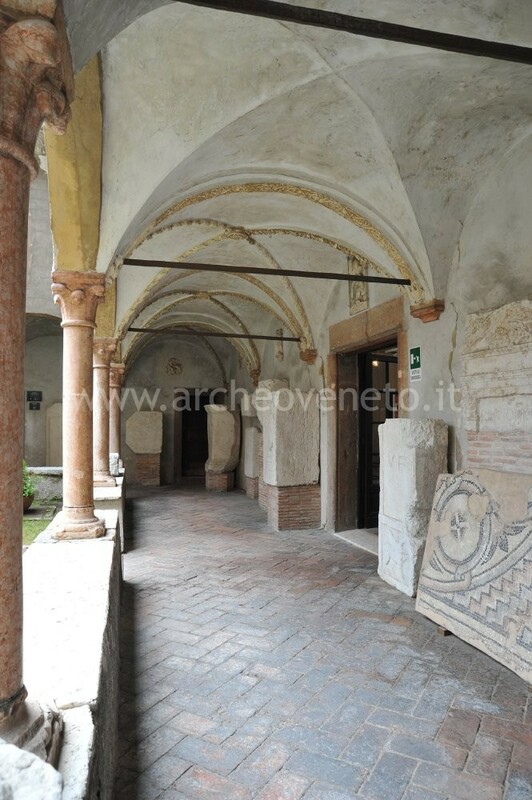 Against the wall of the corridor, where friars’ rooms were, there are different types of sculptures, mostly in white marble, from Verona and from private collections. The first two sculptures are two males, unknown portraits dating to the age of Trajan and Hadrian, respectively (first half of the II century AD). The third one depicts a child and dates to the first half of the I century AD. Against the same wall there are also two female heads; one found in the Arena portrays a young woman and dates to the second half of the I century AD. The other, possibly representing a deity, dates to the early II century AD. In the second part of the corridor (that crosses the main corridor) there is a female bust (possibly a deity) dating to the early II century AD and a portrait of Menander, the famous Greek dramatic playwright who lived in the IV century BC and was a frequent subject Roman sculptors. There is also an high relief in archaic style dating to the late II century AD made of limestone that shows three male figures, as well as a bust of a man with the toga and a satyr’s head, both dating to the second half of the II century AD. Opposite these sculptures, there are three more sculptures— a statuette of naked Venus dating to the first half of the I century AD, a tree signed by the Greek sculptor Praxiteles (Roman copy of the Greek original) found in Piazza Duomo, and a bust of a naked ephebe dating to the first half of the II century AD. In the first of two adjacent friars’ rooms bronze statuettes from private collections are displayed. In the first case there are three bronzetti (small bronzes) of Venetian production representing horse-riders (VI-V century BC), six Italic bronzetti of bovines and horses (VI-V century BC), and eight Etruscans bronzetti representing offerings and kouroi (VI-V century BC). In the second case there is a series of Etruscan-Italic figurines of a warrior or Mars (first half of the IV century BC), a small Apollo (IV century BC), a young athlete, and Hercules with arch and club (first half of the V century BC). In the same case there are also eight bronzetti representing Hercules (V century BC), a prone dancer, and an Etruscan-Campanian Silenus. In the last case of the room there are many votive female figurines, Apollo, two kouroi (young men). One of the kouroi originally decorated a lid. 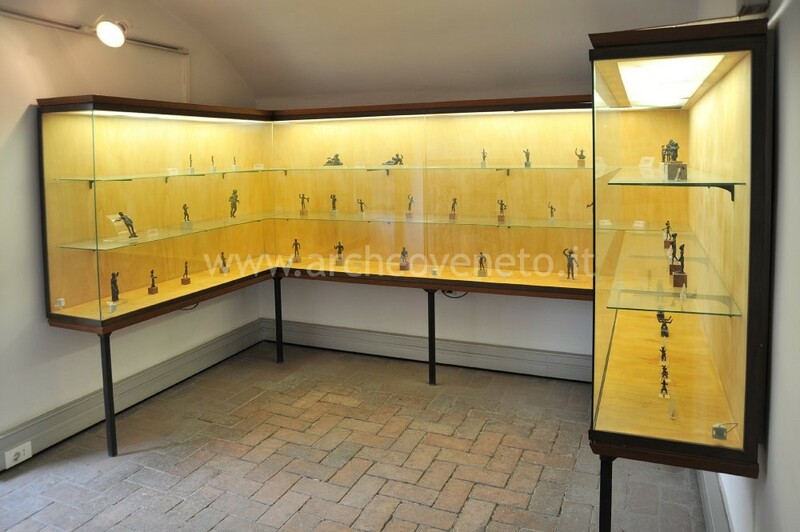 In the second room there is a collection of bronzetti from the hinterland of Verona dating to the Roman Imperial period; these include figures of small animals, satyrs and a horseman. The exhibit of figurines continues with depictions of deities, such as Mercury, Diana, winged Victory, Fortune, Minerva and Hercules. Of particular interest is a bronzetto from Isola della Scala representing Hercules fighting Anteus. On the last shelf there is a fine two-face female herm from Verona (early Imperial period). 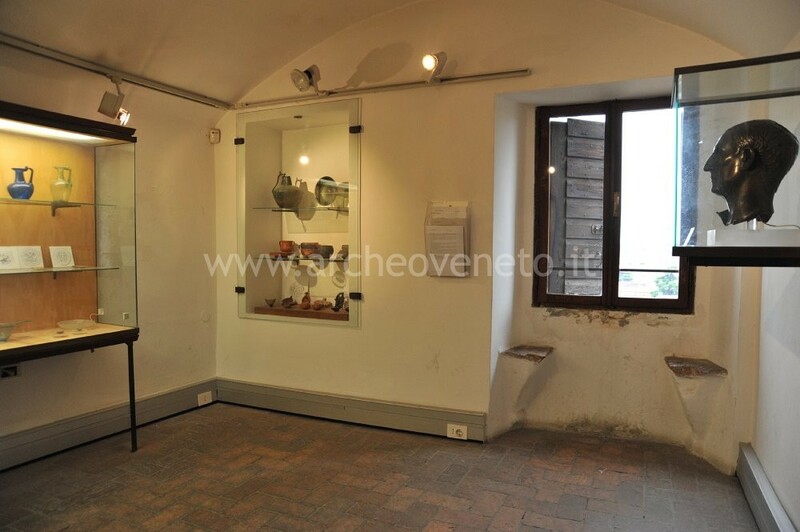 At the room’s entrance, there is a fine Roman bronze from between the late I century BC and the early I century AD found in Pestrino, near Verona. It is probably a portrait of a powerful yet unknown local person. The first case displays many objects for daily use, such as fine terracotta and metal lamps (often with a producer’s mark), various examples of ceramic tableware, a plate, a bronze bowl decorated with a woman’s head, and a bronze vessel to hold liquids. In the second case there are many glass objects dating to the Roman Imperial period, from the hinterland of Verona. These are grouped according to form and typology. On the first shelf there are cups and glasses of various forms, a pan and a plate. On the second shelf, there are small vases of different forms and colours, cups for drinking, and three gold-bottomed Late Antique vessels (from Rome) showing Christian images. On the highest shelf two pots and bottles for water and wine are displayed. 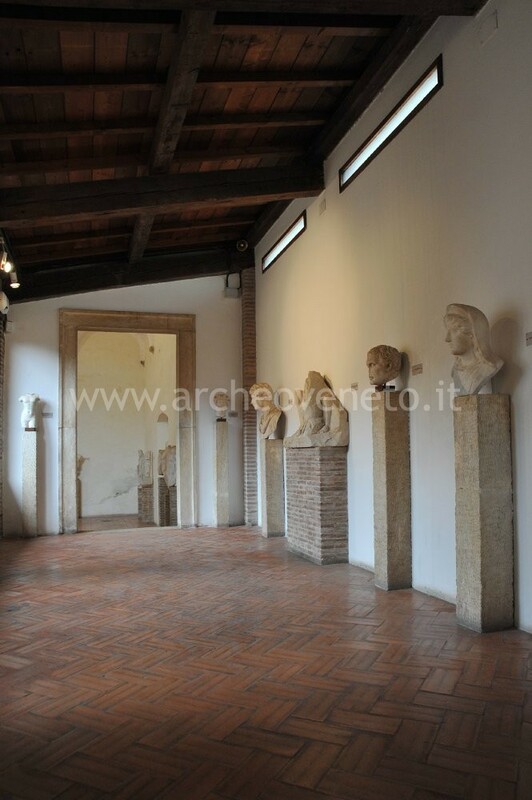 In the canteen there are Roman marble sculptures from excavations carried out in the centre of Verona. Against the right wall of particular interest are: a fragment of a statue of a young person (first half of the I century AD), a statue of Artemis in the same form as those from the temple of the goddess at Ephesus (second half of the II century AD), and a statuette of Zeus ‘Soter’ (first half of the second century AD). Against the wall opposite the entrance there are two large female statues dating to the I century AD (from Piazza Duomo), a male, Hellenistic style bust, and a Pudicitia type statue dating to the early II century AD. In the middle of the room there is a beautiful statue of a seated female, probably a copy of an original from the school of Phidias, found in Piazza Duomo. Close to it there is a III-IV century AD polychrome mosaic showing animals related to Dionysiac myths, from Vicolo Balena. Against the left wall there is a big statue of Roman togatus dating to I-II century AD (the head and the hand were probably made by Antonio Canova). Close to it, there are two bearded heads, an architectonic relief belonging to a funerary monument decorated with leaves of vines and grapes, and a male bust dating to the mid-I century AD. From the extraordinary upper walk, adorned with architectonic elements from the city of Verona and its hinterland, one can enjoy a fine view of Verona. The view from the Large Terrace is also interesting, as are the Roman structures against the hill. 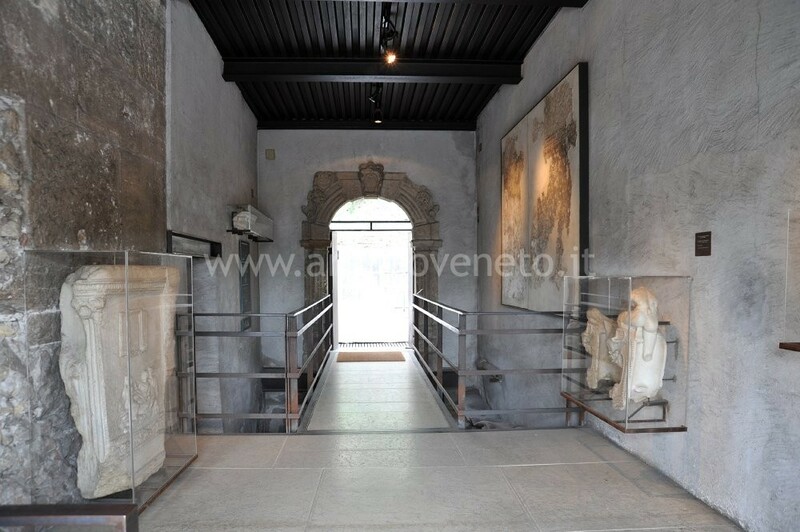 Price: Full fee 4.50 €; Reduced fee (groups, over 60, students, Mantova Verona Card) 3.00 €; Reduced fee for schools and children (8-14, only accompanied by adults) 1 €; Verona residents over 65 free; Verona Card (1 day) 10 €; Verona Card (3 days) 15 €. The thicket gives access to the roman theatre and the Museum. The walk is open on sunday. For guided visits for groups of adults, in Italian or other languages, please call the authorized tourist guides in Verona. Prezzo: 1 ora: 46,00 €; 1,5 ore: 56,00 €; 2 ore: 66,00 €; 3 ore: 92,00 €; 1 giornata: 138,00 €. Eventuali offerte saranno comunicate al momento della prenotazione. I percorsi didattici sono offerti gratuitamente (fino ad esaurimento della disponibilità) alle Scuole del Comune di Verona. L’ingresso ai musei è a pagamento, con la tariffa ridotta per le scuole. There is teaching material available for operators working in the field. 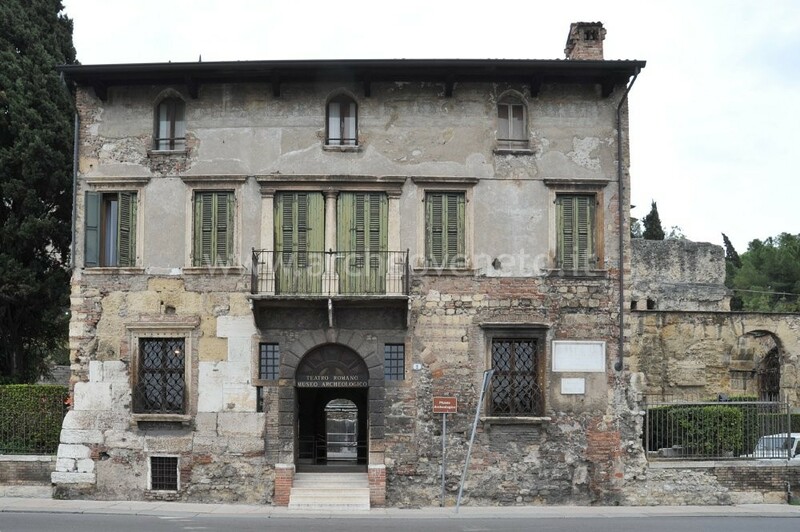 The Museum library is in Castelvecchio. Franzoni L. 1973, Bronzetti romani del Museo Archeologico di Verona, Venezia. Franzoni L. 1980, Bronzetti etruschi e italici del Museo Archeologico di Verona, Roma. Sperti L. 1983, I capitelli romani del Museo Archeologico di Verona, Roma. Modonesi D. 1994, Il teatro romano e il Museo archeologico a Verona, Verona. Larese A., Sgrava D. 1996, Le lucerne fittili del Museo Archeologico di Verona, Roma. Arte e cultura dell’antico Egitto nel Museo Archeologico di Verona 1999, a cura di Bolla M. , Milano. Facchini G.M. 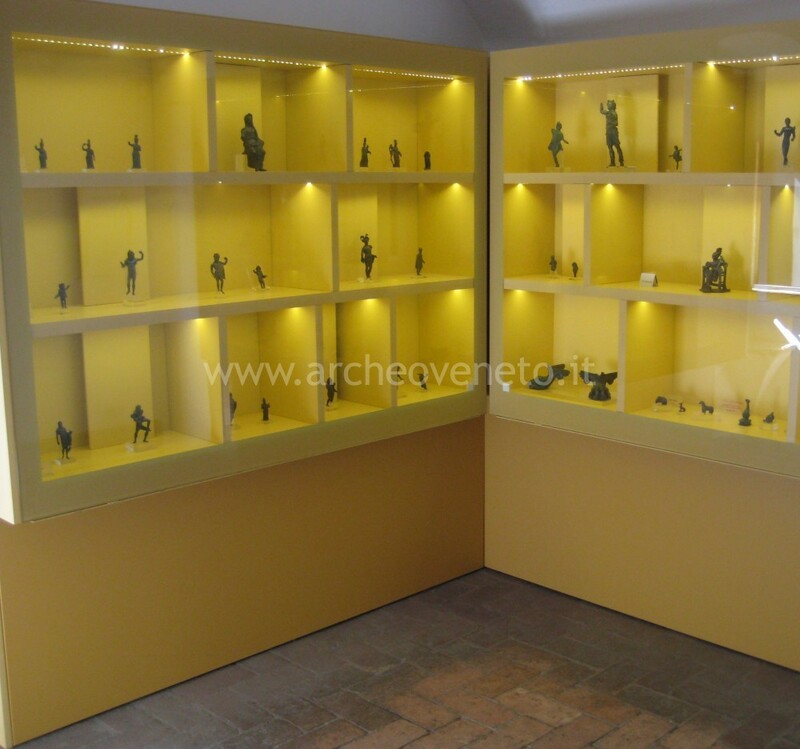 1999, I vetri romani del Museo Archeologico di Verona, in Corpus delle Collezioni Archeologiche del vetro del Veneto, 5, Fiesso d’Artico . 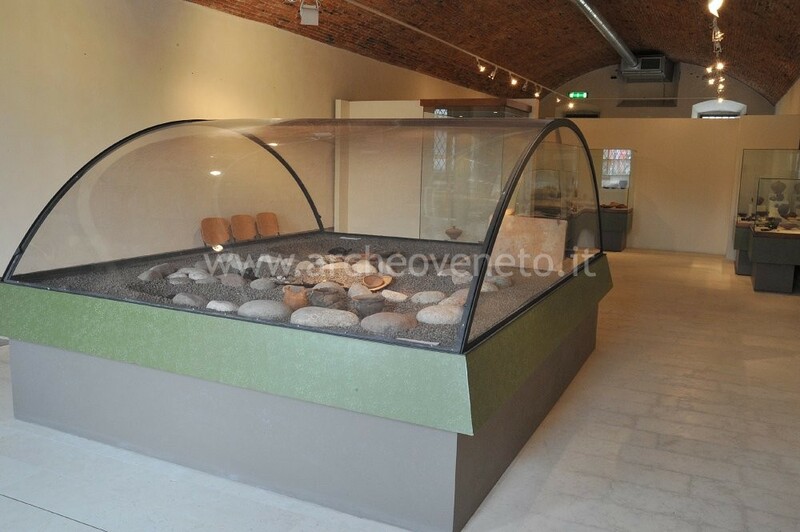 Bolla M. 2000, La zona del teatro romano e il Museo Archeologico, in Archeologia a Verona, a cura di Bolla M. , Milano, pp. 13-28. Bolla M. 2000, Statuaria e cornici di bronzo di epoca romana nel Museo Archeologico di Verona , in Rassegna di studi del Civico Museo Archeologico e del Civico Gabinetto Numismatico di Milano, LXV-LXVI, pp. 33-39. Bolla M. 2002, Sculture del teatro romano di Verona: oscilla e fregio, in Rassegna di studi del Civico Museo Archeologico e del Civico Gabinetto Numismatico di Milano, LXX. Musei e raccolte archeologiche del Veneto 2004, a cura di Di Mauro A., Dosson di Casier, pp. 114-115. Bolla M. 2005, Sculture del teatro romano di Verona, decorative e ioniche , in Quaderni del Civico Museo Archeologico e del Civico Gabinetto Numismatico di Milano, 2, pp. 7-89. 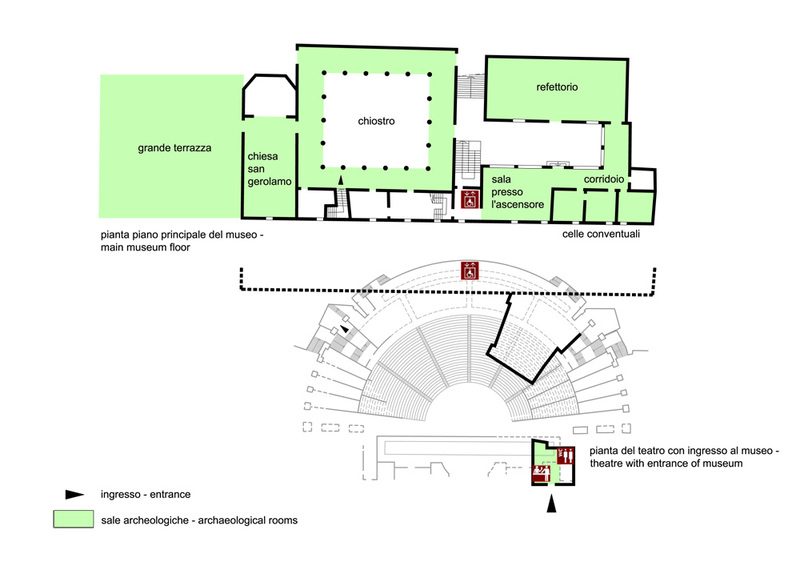 Bolla M. 2006, Il complesso del teatro romano di Verona: un sito d’eccezione per la compresenza di monumenti di epoche diverse, in Conoscere la storia antica attraverso i musei archeologici, a cura di Cenzon M., Venezia, pp. 145-152. Bolla M. 2008, Le iscrizioni del teatro romano di Verona, in Et enim ille flos Italiae. Vita economica e sociale nella Cisalpina romana, Atti delle Giornate di studio in onore di Ezio Buchi, Verona, pp. 77-101. Bonetto J. 2009, Veneto (Archeologia delle Regioni d’Italia), Roma, pp. 351-353. Magni A., Sena Chiesa G., Tassinari G. 2009, Gemme dei Civici Musei d’Arte di Verona, a cura di Sena Chiesa G., Roma.